Lisa Lauren describes herself in her bio as a Jazz vocalist, songwriter, pianist, recording artist and her sound as neo-jazzy pop. 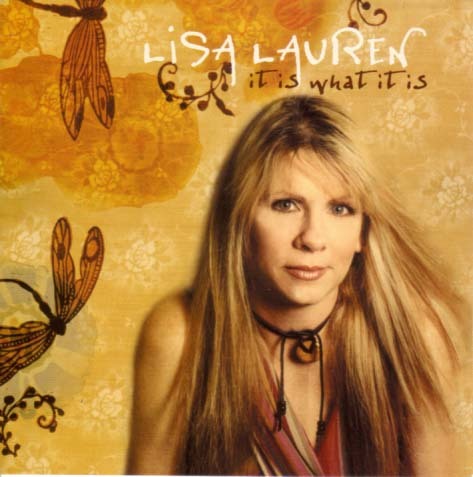 After a first spin of her new album "It Is What It Is" I asked Lisa : "Do you still consider yourself as a jazz artist?" Her answer: "I’m so glad you asked that because now I can explain why I named the CD “it is what it is”!! I don’t know if I EVER considered myself a jazz artist. I’ve always been influenced by jazz and have played with a lot of jazz musicians over the years, but I’ve always felt liked I’ve leaned more toward a pop sound. So when I started recording, the jazz elements just came along for the ride. I just play what I like and since I like a lot of different types of music, the end result is a mix of many styles. It’s funny because I’ve had one person in the radio industry tell me the CD was too jazzy, and another who told me it “wasn’t really jazz”. So I’m thinking that the CD title I chose will be just perfect!" Lisa is often compared with singers like Joni Mitchell or Rickie Lee Jones and frankly that's exact the music you can await on her upcoming album. On her previous albums "My Own Twist" and "What Comes Around" Lisa performed covers of The Beatles with much success. Lisa relies again on this receipt. The album starts with The Word originally by John Lennon and Paul McCartney ("Rubber Soul"). A very uptempo tune with a driving beat. David Sanborn is pushing his alto sax in superior style. You know him. Passing Fantasy is the tune of guitar-master Greg Koch. Greg is a longtime-fan of Jimi Hendrix and when you listen attentively to his dobro guitar play you can hear Jimi's "The Wind Cries Mary". If you want to learn dobro blues, you should listen to Passing Fantasy . But we shouldn't neglect Lisa Lauren, the great singer and song-writer. If you search the similarity to Rickie Lee Jones, you find it in Life Is Good. Short and perfect. I've Just Seen A Face was first released on the album of the Beatles "Help" (1965). In the U.S. the song first appeared on the album "Rubber Soul". This song had originally already a country style. So it's no wonder that Laura choose it for her new I dare to say wonderful interpretation. Why shouldn't a girl have the same sentiments as a man? I'm Looking Through You is a further song from the album "Rubber Soul" (1965). This song was created by the Beatles under the influence of Bob Dylan. Lisa's version is a bit more earthy by selection of Greg Koch's dobro as lead accompany. Dobro is a special guitar having a metal resonator, which was first built by the firm Dopyera Brothers and currently by Gibson. Pull Of The Moon has a romantic swinging attitude. It's her passion song and you can take it for real. Dreamer In Disguise is flowing like a mountain-brook. A hooking melody! One of the greatest hits of the Eurythmics was Here Comes The Rain Again from their album "Touch" (1983). Lisa 's cover version has that gloomy and hypnotic atmosphere of the original. Jim Gailloreto on soprano sax plays a dominant role proceeding the melody-line and adding new accents. Kraig McCreary - together with Jim member of the group "Big Roy" - performs a top-notch job with his guitar solo. Where Or When is a slow vocal contemplation about a possible love with Neal Alger in a very active guitar role. Neal playing in the jazz scene of Chicago has performed with luminaries Lin Halliday and Ron Dewar (both saxophonists), trumpeter Ron Friedman, harmonica player Howard Levy, and has played throughout the city with his own trio and with the band BMR4. The song Eleanor Rigby appeared on several Beatles albums like "Revolver", Yellow Submarine", "The Beatles 1" etc. Lisa revives this tune on her piano and Fareed Haque (acoustic guitar) refines it in his own way to a guitar piece of high degree. Final tune is Daddy's Lullaby written by B. Pollack. A sensitive fall of the curtain. So I go back to my first question and Lisa's answer: "It Is What It Is." Without any doubt good music.